Following on from supply and demand, there needs to be a way to chart and understand this relationship in visual form. 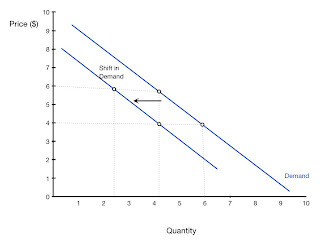 Economists use the supply and demand curve to do so. It is best to get acquainted with the graphical representation of the study before they become too much. In the diagram below, supply is illustrated by the upward sloping blue line and demand is illustrated by the downward sloping green line. 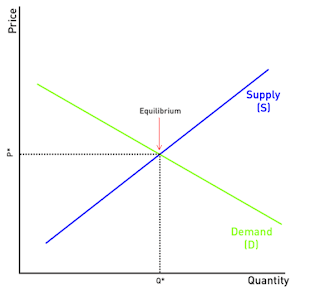 At a price of P* and a quantity of Q*, the quantity demanded and the supply demanded intersect at the Equilibirum Price. At equilibrium price, suppliers are selling all the goods that they have produced and consumers are getting all the goods that they are demanding. This is the optimal economic condition, where both consumers and producers of goods and services are satisfied. 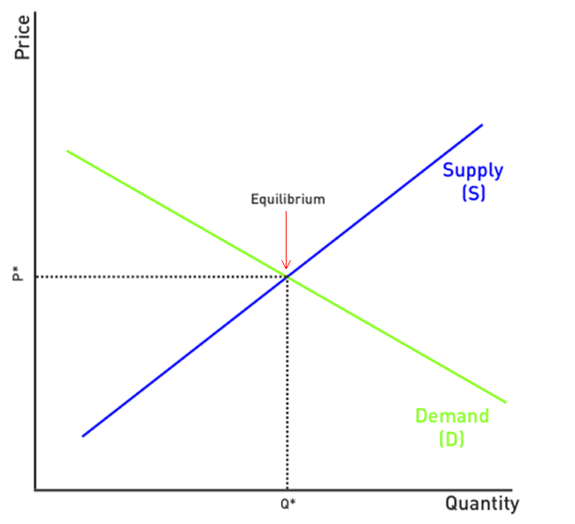 The quantity demand is the price and quantity the market is willing to pay for an item. Price and quantity demand have an inverse relationship. When price goes up the demand goes down, and when demand goes down the price goes up. The use of this graphing can enable you to make market predictions. 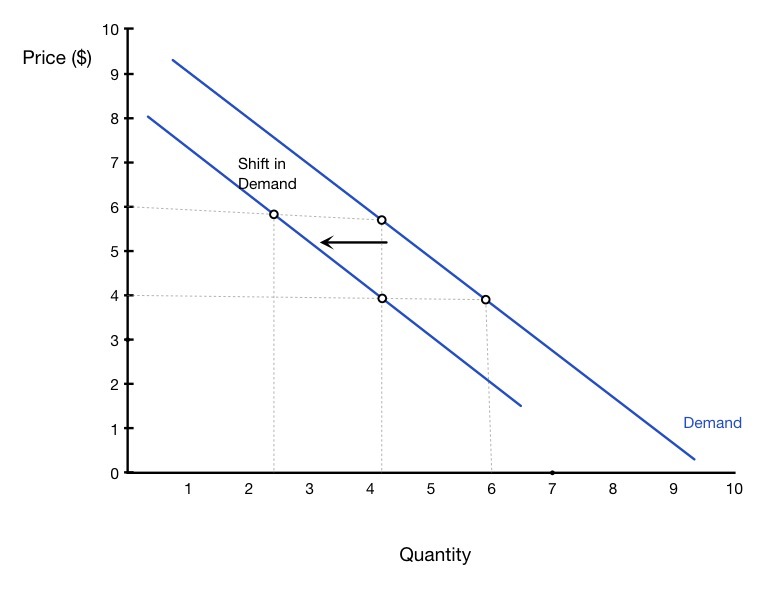 The shift of a demand curve takes place when there is a change in any non-price determinant of demand, resulting in a new demand curve. Non-price determinants of demand are those things that will cause demand to change even if prices remain the same—in other words, the things whose changes might cause a consumer to buy more or less of a good even if the good's own price remained unchanged. Some of the more important factors are the prices of related goods (both substitutes and complements), income, population, and expectations. However, demand is the willingness and ability of a consumer to purchase a good under the prevailing circumstances; so, any circumstance that affects the consumer's willingness or ability to buy the good or service in question can be a non-price determinant of demand. So a good example of a shift of demand is policy changes: The government changes the law on smoking in public places and forces smokers to smoke outside holding a picture of a cancer cell. The tobacco control policies can affect consumer buying decisions and can alter the supply and demand of cigarettes. Changes in tastes and preferences - tastes and preferences are assumed to be fixed in the short-run. This assumption of fixed preferences is a necessary condition for aggregation of individual demand curves to derive market demand. increase in consumer income if the good is an inferior good. a change in the distribution of income among consumers with different tastes. Increase in income if good is inferior good.